The First Strike 5 MOA Red Dot is Bushnell's entry in the growing low-profile tactical red dot market. 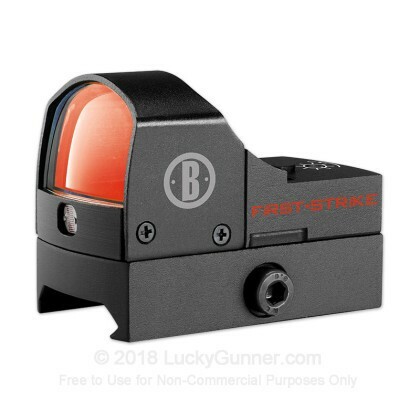 At only 2 inches in length, the First Strike Red Dot takes up significantly less rail spaces than traditional, tube-style red dots, while allowing a wider viewing angle for greater tactical awareness. The sight is 100% waterproof, fog-proof and shock-proof and features self-regulating brightness controls. This red dot is small enough to mount on a handgun or carbine.